Crafted to look like Luke's landspeeder in A New Hope. Luke Skywalker owned a nondescript but speedy landspeeder, racing the sand-pocked and sun-faded craft across the desert between the Lars homestead and outposts like Tosche Station and Anchorhead. Crafted to look like Luke's landspeeder in the original Star Wars film, A New Hope, this 6-inch scale Star Wars Black Series Luke Skywalker Landspeeder Vehicle is exquisitely detailed with a true-to-story design and incredible features. 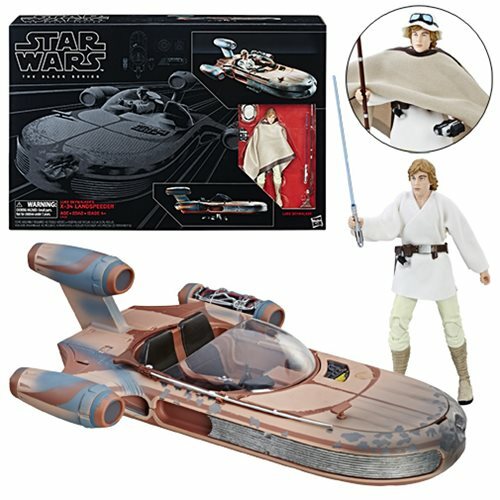 Created for ultimate collectability and display, both the speeder and the included Luke Skywalker figure feature movie-real detailing. Luke has multiple points of articulation, while the X-34 landspeeder includes a clear stand for display. Ages 4 and up.